Scientists from the United States and Japan plan to share asteroid specimens from the OSIRIS-REx and Hayabusa 2 sample return missions under an agreement signed by NASA and the Japan Aerospace Exploration Agency. The missions will explore two different asteroids later this decade, with Hayabusa 2 heading for a 3,000-foot-wide carbon-rich asteroid named 1999 JU3 and OSIRIS-REx targeting the slightly smaller asteroid Bennu, a near-Earth object that has a slight chance of striking Earth. NASA Administrator Charlie Bolden and JAXA President Naoki Okumura signed a memorandum of understanding Nov. 17 in Tokyo covering cooperation on the two asteroid missions. Under the terms of the agreement, NASA will receive 10 percent of the sample collected by Japan’s Hayabusa 2 mission. JAXA will get one-half of one percent of the OSIRIS-REx sample, according to Dwayne Brown, a NASA spokesperson. Hayabusa 2 is designed to return to Earth with at least one gram of material, including samples from beneath the surface of asteroid 1999 JU3. OSIRIS-REx will bring back a minimum of 60 grams — about 2.1 ounces — of samples from the surface of asteroid Bennu. 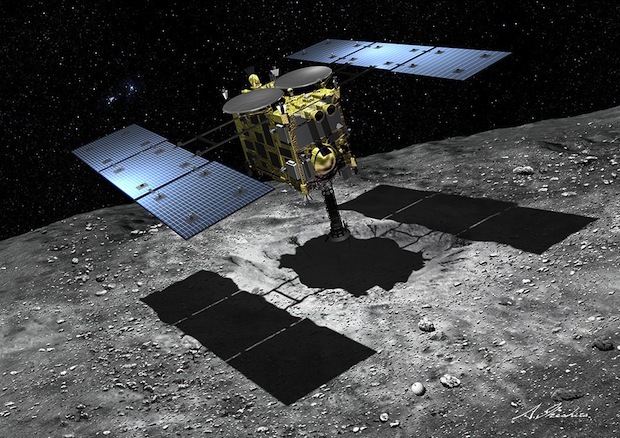 Assuming each mission collects the minimum sample, NASA would receive about one-tenth of a gram of rock fragments from Hayabusa 2 and JAXA would get three-tenths of a gram from OSIRIS-REx. 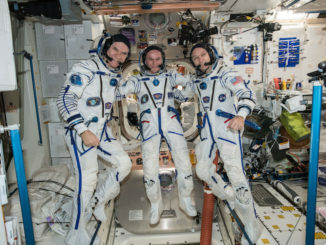 The accord signed by NASA and JAXA makes provisions for the exchange of samples even if one of the missions fails, said John Grunsfeld, head of NASA’s science directorate. 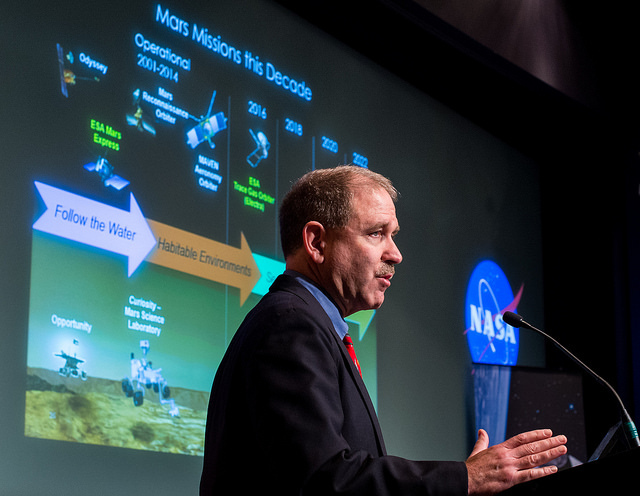 Missions to small objects in the solar system are important and exciting, Grunsfeld said in an interview with Spaceflight Now. He said Hayabusa 2 and OSIRIS-REx will build on the success of the European Space Agency’s Rosetta mission to a comet, which achieved the first landing on a comet’s nucleus in November. 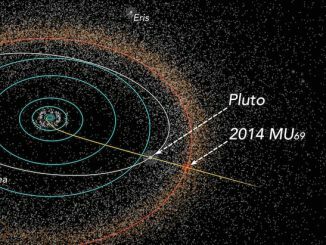 “With the success ESA had with Rosetta and Philae landing on a comet, it’s obvious this kind of exploration really captures the public’s interest,” Grunsfeld said. “We’re not just exchanging the samples,” Grunsfeld said. NASA will support the curation of asteroid samples retrieved by Hayabusa 2, and the U.S. space agency’s global network of deep space communications antennas will track the Japanese mission’s journey. Japan offered NASA a fraction of the microscopic specimens returned from asteroid Itokawa by the Hayabusa 1 mission in 2010. NASA has also agreed to send 4 percent of OSIRIS-REx’s sample to Canada in a barter agreement to pay for a Canada’s contribution of a laser altimeter sensor to the mission. In a best case scenario, scientists say the Japanese asteroid probe could bring back up to several grams of specimens and OSIRIS-REx could gather up to a two kilograms, or 4.4 pounds, of material. “Successful sample collection from both target asteroids is expected to provide knowledge on the origin and evolution of the planets, and in particular the origin of water and organic matter on the Earth,” said Dante Lauretta, principal investigator for the OSIRIS-REx mission from the University of Arizona. 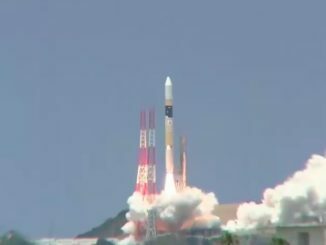 Hayabusa 2 launched on an H-2A rocket Dec. 3 from the Tanegashima Space Center in southern Japan to begin an six-year roundtrip journey to asteroid 1999 JU3. The spacecraft will arrive at the asteroid in June 2018 after swinging by Earth late next year to get a boost to the mission’s destination, which circles the sun between the orbits of Earth and Mars. Hayabusa 2 will spend a year-and-a-half at asteroid 1999 JU3, enough time for the probe to pick up rock specimens from three different locations on the unexplored asteroid. The robotic craft will depart the asteroid in December 2019 and return to Earth in December 2020 for a scorching re-entry and parachute-assisted landing in the Australian outback. NASA’s Origins, Spectral Interpretation, Resource Identification, Security, Regolith Explorer, or OSIRIS-REx, is set for liftoff from Cape Canaveral, Fla., aboard an Atlas 5 rocket in September 2016. The mission will swing by Earth for a slingshot maneuver a year after launch and reach asteroid Bennu in 2019. After a close-up survey of the asteroid, scientists will select a sampling site where the OSIRIS-REx spacecraft will descend and snag a specimen of rock and dust from Bennu’s surface. The mission will deploy a landing capsule containing the samples to parachute to touchdown in Utah in 2023. Researchers say asteroids 1999 JU3 and Bennu slightly different types of worlds, but both may harbor organic compounds left over from the chaotic earliest period of the solar system’s history. Asteroids are the remnant building blocks of planets and may hold clues to how water and life came to be on Earth.